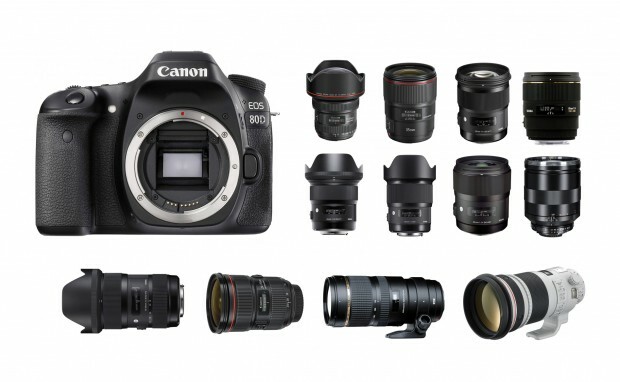 The Canon EOS 80D is Canon’s latest APS-C DSLR camera to replace current Canon EOS 70D. EOS 80D offering a newly developed 24.2MP APS-C sensor, 45-point all cross-type autofocus module, updated Dual Pixel AF for live view still and video recording, and Wi-Fi with NFC. The US price for Canon EOS 80D starts at $1,199, you can check deals of Canon EOS 80D here. 35mm, 50mm prime lens is very popular, a must be lens for Canon EOS 80D. Of all these lenses, the new Zeiss Otus 55mm f/1.4 lens is the best prime lens for Canon EOS 80D, except the expensive price tag. The Sigma 50mm f/1.4 DG HSM Art lens, EF 35mm f/1.4L II USM lens, Sigma 35mm f/1.4 Art Lens are another great choice for Canon EOS 80D, buy the price are also not very cheap. If you are looking for a cheap prime lens for Canon EOS 80D, the EF 50mm f/1.8 STM lens a cheap and very good lens, yet cost only around $100. Other recommended lenses are EF 35m f/2 IS USM, Sigma 30mm DC and EF-S 24mm f/2.8 STM lenses. The new Tamron SP 35mm/45mm f/1.8 lenses and Zeiss Milvus 35mm f/2/50mm f/1.4 lenses are also great lens for Canon EOS 80D. If you are looking for a telephoto prime lens for Canon EOS 80D, the best ones are come from Zeiss, both Zeiss 135mm f/2 and Otus 85mm f/1.4 have the best image quality in this range. The Sigma 85mm f/1.4 EX DG HSM lens and EF 100mm f/2 USM are both very cheap lenses, but has great image quality on Canon EOS 80D. The best super telephoto prime lenses are EF 300mm f/2.8L and EF 400mm f/2.8L. If you are choosing a wide-angle or ultra-wide prime lens for Canon EOS 80D, the best choice is the new released Sigma 20mm f/1.4 DG HSM art lens, world’s first prime lens has f/1.4 aperture at 20mm. And the price is not very expensive compared to EF 24mm f/1.4L and Zeiss wide-angle prime lenses. The Samyang wide-angle lenses are also good choice for 80D. Of all these standard zoom lenses, the Sigma 18-35mm f/1.8 DC HSM lens the king of APS-C lens, this lens is even better than some prime lenses. This lens has highest DxOMark, 5 points better than second best standard zoom lens. Below are top telephoto zoom and super telephoto zoom lenses for Canon EOS 80D. The best one is of course the new announced Sigma 50-100mm f/1.8 DC HSM Art lens. For wide-angle zoom lenses, below are some of top choices, the EF 11-24mm f/4L USM is the best wide-angle zoom, but the price is also very expensive. The Tokina 11-16mm f/2.8 DX and Sigma 10-20mm f/3.5 DC are good and cheap lenses for Canon EOS 80D. The best macro lens for Canon EOS 80D is Zeiss 100mm f/2 ZE, but as you know, the pirce is very expensive. The Sigma 70mm and Canon EF-S 60mm f/2.8 is one of best choice for 80D at a very cheap price.